Back in January Yonah Freemark in his Transport Politic blog talked about a program in Baltimore which is starting local circulator routes separate from the main MTA bus service. The city is financing the routes through a additional fee on parking. 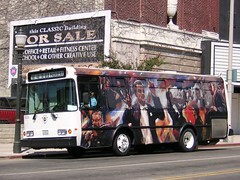 If you look at the Los Angeles area, many cities sponsor their own transit service over and beyond the main bus routes operated by MTA and select other operators. These services are funded by a sales tax initiative that provided construction funds for rail transit and a city option fund. The city of Pasadena for example started with a shuttle down their main shopping districts streets of Colorado and lake and have expanded the service to cover most of their city plus replace some low ridership MTA routes in which that agency could no longer afford to operate. 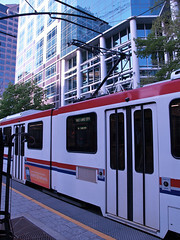 In the past we have heard calls for UTA it reduce bus fares in the city of Salt Lake. While the cost per passenger is less in the city than in the rest of the county because of its higher density, it is fair to charge people different rates just because they are boarding in a certain area? Some would say yes some would argue the opposite. 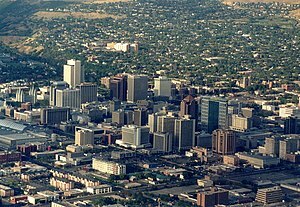 If UTA was to reduce bus fares just in the city of Salt Lake then the city of Salt Lake should fund that reduction through their general fund. Instead of creating a nightmare for UTA drivers with fares, the city of Salt Lake could look at creating its own network of circulators in the city. The city could take over Route 500 from UTA plus provide service to the new Harmons, the library, Trolley Square and senior citizen housing in the area. In other words improve the transportation options for the many new residents moving into the downtown area and vicinity. The service could be contracted out to a company such as Le Bus or Lewis Brothers Stages to provide the drivers and the maintenance of the vehicles. To fund the system the city could look at property taxes which are never popular, or through parking fees like the city of Baltimore is doing. This will avoid the volatility of the sales tax which is hampering current UTA services. One of the things I have repeatability pointed out is that the current system of funding transit systems in the US is very volatile and we have seen that during this extended period of economic downturn. In good times sales tax goes up and in bad times often when it is needed the most by the transit system sales tax receipts go down. The city could also look at taking over UTA routes that operate all within their borders. If Salt Lake where to do that they would need to insure ease of transferability between their system and the UTA if fares are to be charged. The last thing you want to do is create two separate systems that don't cooperate with each other like in some other cities like the Los Angeles region. What this alternative transit should not be used for is a way to stick it to the UTA. The primary purpose in establishing an alternative transit line would be to improve the transit options for the residents, visitors and workers in the area. If the primary purpose of the system becomes a way to stick it to the UTA, it is doomed to failure. The articles discuses a project in Gresham, Oregon which is on the far eastern side of Portland's MAX light rail system. The article shows how the county planning agency took the lead to see that a TOD project was built and now it is leading to additional investments in the area. In 1987, I made my first trip to Portland to stay for a few nights and I happened to stay in Gresham proper since it was near the then new "MAX" light rail line. At the time the city was typical suburbs with park N ride lots at the transit stations but nothing near by similar to what TRAX started out with. However, by 2004 when we made multiple trips to the city, the whole area has begun to change. There is more development near the transit stations giving residents a choice to leave near a transit station and use a car less. Here in Salt Lake City we are starting to see the first phases of TOD taking shape. The Fireclay project is starting to expand, the new transit station is accepting residents which sits near the 3900 South station (although I have some reservations about that project and I will share them in the future), and new homes are going up at the Sandy Civic Center TRAX station. Another problem the article mentions is when economic development councils subsidize car oriented development. We have seen this when certain big box retailers are given substantial subsidies to build in certain locals with politicians salivating over the sales tax that they will bring in despite the evidence that these developments often cost more than they bring in through additional infrastructure cost. Like the problems with the Davis county NIMBY's, the problem comes down to a lack of experience with something new. As these developments become more common, the banks will be more willing to invest in these projects. All of the new TRAX lines now being built have excellent TOD possibilities, so now is the time to get projects under our belts and allowing all concerned to become better acquainted with the concept that will allow new alternatives to our present development patterns. Below is the FrontRunner South construction update May 29 – June 4. Please visit UTA’s FrontRunner South Webpage to learn more about the project. Note: Construction crews will not be working on Monday, May 31 in observance of the Memorial Day holiday. At the 3300 South bridge crews will pull lagging at the south abutment, form and tie rebar at north abutment and also excavate and stabilize in the area. At the 4500 South bridge crews will install temporary shoring for and excavate at the north abutment. Tree removal and fiber relocation will also take place near the bridge site. The westbound right lane will be closed on 3300 South between I-15 and 500 West Tuesday through Friday. Water line work continues near 4800 South this week and crews will also be relocating fiber and installing signal infrastructure. At the 5300 South bridge crews will form and tie rebar for a cheek wall and at the I-215 westbound bridge crews will conduct a final inspection of the bridge. Between Center Street and Wasatch Street crews will continue balancing the grade and at the bridges over Center and Wasatch Streets they will be placing surcharge. The eastbound right lane will be closed on 4500 South Thursday and Friday. There will be truck traffic with flaggers on 4800 South Tuesday through Thursday. Storm drain work continues between Wasatch Street and 9000 South and retaining wall stabilization continues between 9000 South and 9400 South. At the flyover bridge crews will work on the northwest wall. Storm drain work will continue at 10000 South and bridge work will begin at 10600 South. Between Jordan Gateway and 11400 South crews will be clearing and grubbing and creating access. They will also be removing duct near the site of walls that will be constructed in this area as well as south of 11400 South. Mass excavation and embankment work continues between 11400 South and 12300 South. At the Bangerter Highway bridge, crews will continue work on a pier soffit and pier cap and install shoring, drill soil nails and excavate at the north abutment. On 10600 South, all westbound lanes and the eastbound left lane will be closed from Saturday, June 5, at 8:00 p.m. until Monday, June 7, at 5:00 a.m. The two westbound left lanes and the eastbound left lane will be closed on Bangerter Highway Tuesday through Friday. Crews will demolish the old Union Pacific track at the Mesa Siding to prepare for construction to begin on UTA’s track north of Club House Drive. Repair work will continue on the wall north of Cranberry Farms along Garden Drive and at the 2300 West bridge crews will continue to form and tie rebar for the north abutment beam seats. At the 2100 North bridge crews will continue work on the pier cap for pier #5 and also backfill at this pier. Work will continue on the retaining wall between 2300 West and 2100 North and between 300 South and Center Street crews will continue to install reinforced concrete pipe and a catch basin. There will be truck traffic with flaggers on Garden Drive near the golf course Tuesday through Friday. At 100 West in Lehi on Friday there will be truck traffic with flaggers. At the pedestrian tunnel crews will continue forming and tying rebar for the footings and also form the base for the ramp and stairs. Crews will distribute rail between 200 South and 100 East in American Fork and also construct a signal house pad and install a signal house at 100 East. Crews will also place bottom ballast near this area. Crossing improvements will take place at the 400 South crossing in Orem Thursday, June 3 through Sunday, June 6. Between 400 South and 800 South crews will place bottom ballast and a ballast mat. The 400 South crossing in Orem will be closed from Thursday, June 3, at 6:00 p.m. until Monday, June 7, at 5:00 a.m.
At the Park and Ride Lot crews will wash and seal white paving, grade for sidewalks and continue landscaping work. Crews will continue placing vapor barrier and rebar. Crews will be removing a sound wall just south of University Parkway in Orem, so they can begin work on the grade, and installing chain link fence at 2000 North in Provo. Between 1680 North and 820 North crews will continue to surface, line and dress the track. Road striping will take place at 500 South 900 West, 600 South and 400 South and track construction will take place between 700 West and Freedom Boulevard. Permanent fencing will be installed between 600 West and Freedom Boulevard and from University Avenue to 900 South crews will be clearing and grubbing the corridor and conducting mass excavation work. At the 2000 North crossing in Provo there will be concrete work on Tuesday and truck traffic with flaggers on Wednesday. Crews will continue to place granular fill for the platform. reply message indicating you wish to unsubscribe. * Redwood Road will be closed at the railroad crossing at approximately 8050 South in West Jordan from 10 pm Saturday, June 5 through 2 pm Sunday, June 6. Please use an alternate route. *Winchester Street will be closed between the TRAX crossing and 300 West (Cottonwood Street) from May 24 through June 1. It will reopen Wednesday morning, June 2 at 5 am. * The Jordan River Parkway Trail will be closed from 7800 South north to the UTA Jordan River bridge for approximately two weeks, from June 3 through June 18. Work continues on the landscaping at the 5600 West station and Park & Ride. Crews are installing concrete bench foundations and sidewalks at the station platforms. Track and grading/drainage work is moving forward in Old Bingham. OCS installation is essentially complete, and the station platform concrete work continues. The bus loop at the 4800 West station on Old Bingham Highway is nearly complete. Construction of the Redwood Road rail crossing is in progress. The 2700 West Park & Ride lot will be paved this week. Concrete work is moving forward at the Bangerter and 2700 West station platforms, and foundations for OCS poles are being installed. * NEW ACTIVITY: Rail installation at the Redwood Road rail crossing. TRAFFIC IMPACT: Redwood Road will be closed from approximately 8020 South to 8150 South beginning Saturday night, June 5, at 10 pm. Redwood Road will reopen at 2 pm on Sunday, June 6. TRAFFIC IMPACT: From 7 pm Friday, June 4 through 5 am Monday, June 7, all traffic on Redwood Road will be shifted to the west side of the street (the three northbound lanes) between 7600 South and 8600 South. The Jordan River Parkway Trail will be closed between Thursday, June 3 and Friday, June 18 as crews begin widening the embankment of the rail right-of-way between 7800 South and the Jordan River. Embankment work is in progress between 1300 South and 7800 South. Work continues at the Jordan River bridge and the 700 West bridge. * NEW ACTIVITY: Embankment work between the Jordan River and 7800 South. TRAFFIC IMPACT: The Jordan River Parkway Trail will be closed from 7800 South to the Jordan River from Thursday, June 3 through Friday, June 18. * NEW ACTIVITY: Concrete work at the 700 West bridge. TRAFFIC IMPACT: Lane closures on 700 West at the railroad bridge (approximately 7400 South) on Tuesday, June 1. The new rail crossing at Winchester Street is scheduled for construction beginning May 24. Crews will reconstruct the existing northbound TRAX crossing as well as construct a new crossing for the Mid-Jordan line. The excavation for the new Fashion Place station platform should be complete next week. Track work, including switches, derails and signals, is progressing. Work is also moving forward in the Lovendahl Yard. * NEW ACTIVITY: Construction of a new rail crossing at Winchester Street and renovation of the existing crossing. TRAFFIC IMPACT: Winchester Street will be closed between the TRAX crossing and 300 West (Cottonwood Street) from May 24 through June 1. * NEW ACTIVITY: Concrete work at the 7200 South TRAX bridge. TRAFFIC IMPACT: 7200 South will have lane closures in place on Wednesday, June 2 and Thursday, June 3. Work continues on wet and dry utility work along 3700 West. Various traffic restrictions are in place for internal airport traffic; however, access is being maintained. Beginning the first week of June, crews will excavate the east side of 3700 West from the United States Post Office to 400 North. During this time lane restrictions will be in place; however, access will be maintained. We will meet with businesses as we get closer to construction. Crews are currently working on walls and excavating the guideway between the X Bar Bridge and 3700 West. Work continues on the second phase of construction at the North Surplus Canal. This phase of construction will include diverting the water, de-watering the culvert, excavating and forming the culvert walls and floors. This work will be complete by mid-June. Now that girders are in place, crews are beginning items associated with the “Deck Work” at South Surplus Canal. Curb, gutter, sidewalk and wet and dry utility work continues to make its way west. Old North Temple is now reopened; however, on June 2 crews will close it again to relocate a power line conduit. This work is anticipated to take five to seven days and traffic will be detoured to 2200 West. As we get closer to construction we will be meeting with businesses in this area. Wet and dry utility work is currently taking place on North Temple approaching Redwood Road. Crews are currently relocating utilities and reconstruction driveways on the south side of North Temple between Redwood Road and 1950 West. During this work there will be lane restrictions, but access to all businesses will be maintained and signage will be provided. Early next week crews will begin work on a water line at the 1950 West and North Temple intersection. This work is expected to last three days and access will be maintained. In approximately two weeks crews will begin sewer sag repairs at Orange Street and North Temple. At this time various lane restrictions will be in place; however, access to businesses will be maintained and signage will be provided. As we get closer to construction we will be meeting with businesses in this area. Crews will begin relocating hydrants and water services in the upcoming weeks. As we get closer we will meet with businesses and coordinate any planned interruptions to services. Traffic Impacts: There are currently right/left lane restrictions between the I-215 overpass and Redwood Road. As work progresses, there will be additional lane restrictions for both east and west bound traffic. Access will be maintained at all times. Work continues on the south side of the Jordan River Bridge as crews have begun the second phase of construction, which includes diverting the water and pile driving activities. The bridge is scheduled to be completed before the State Fair begins in September. Crews are currently installing a storm drain on the south side of the Jordan River Bridge. Heavier construction is anticipated to begin in summer 2010. Early next week crews will be replacing a small stretch of sidewalk on the north side of North Temple between the I-15 overpass and 600 West. This work will take place for approximately three days and a pedestrian walkway will be in place. City Creek West relocation will take place from the Jordan River Bridge to 1000 West in mid June to late August. Traffic Impacts: Traffic management is currently in place near the Jordan River Bridge and is limited to one lane in each direction. The North Temple Viaduct re-construction project has begun and will last for approximately 18 months. Crews are nearing completion of the demo portion of the work. No night work is scheduled for the viaduct; however, if Union Pacific Railroad grants approval for night work we will notify all residents and businesses as soon as possible. Please see the viaduct construction guide which is attached below to find out how to get around during construction. Amid an economic tightening of belts, Leatherbys wants to ensure its patrons have to loosen theirs with a collective sigh. Leatherbys is an ice-cream lover's paradise, playing an integral role in not only delivering gourmet ice-cream, but opportunity for an expanding community as well. The family-owned and operated ice cream eatery first opened its doors on North Temple and 735 West near the heart of downtown in March of 2004, offering up the nostalgia of yesterday with a no fuss approach. Leatherbys offers a family-friendly dining experience that is great for any occasion. Celebrate anyone’s birthday, whether they are marking one or 100 birthdays, come discover the real taste of ice cream at Leatherbys. Just as it is close to everything downtown, but far enough away to provide free parking, Leatherbys offers wholesome and affordable food for those who enjoy all that Salt Lake City has to offer. Leatherbys has a variety of desserts that will satisfy any sweet tooth and compliment each event -- whether it’s a play at Capital Theatre, celebrating the Ute’s win, or watching a Jazz play-off game or concert. Dive in to the bliss of a Black and Tan Sundae topped with homemade caramel and chocolate. Share a banana split with a co-worker, or enjoy the Raspberry Chocolate Rhapsody. Leatherbys also offers a simple yet satisfying menu that would be worthy of “grandma's” cooking. Try a local favorite, the Pastrami Burger, or experience the thrill of a Bar-B-Que Roundup....all served on homemade buns. Bacon Cheeseburgers, Philly Cheesteaks, fish and chips, and freshly made soups and salads are always available, made when you order and guaranteed to not only leave you full, but more importantly, satisfied. Construction is permitted to take place between 7 a.m. to 7 p.m. Monday through Saturday. Additionally, specific activities may require different working hours depending on conditions and will be coordinated with city officials. Construction progress continues on the West Valley TRAX Line. To keep business and traffic impacts to a minimum, this five-mile project has been separated into seven construction “reaches,” or segments, for management and planning purposes. The map below shows each construction reach in a different color, starting with Reach 1 in light green on the south end of the project and ending with Reach 7 in light green on the east end of the project. · Overhead wire work continues along Constitution Boulevard. · Crews are currently forming and pouring the platform at West Valley City Hall. · Crews are currently constructing the roadway just north of 3500 South on the west side of Constitution Boulevard. · Night work will take place near the 3100 South and Constitution Boulevard intersection from May 31 through June 12 as crews work on an electrical communication system. Noise is anticipated to be minimal during this night work. Traffic Impacts: There currently are lane restrictions along Constitution Boulevard; however, access is being maintained. Reach Description: Reach 2 is the area along 3100 South from Constitution Boulevard to Decker Lake Drive. The E Center and a few other businesses are located in this reach, as well as residents on either side of 3100 South. Access will be maintained throughout construction and we will coordinate with the E Center so you can continue to visit the great events they have to offer. When TRAX is completed along 3100 South, it will operate on the south side of the roadway. · Work on the overhead electric system is also taking place near Decker Lake Drive and 3100 South. · Traffic control is in place along 3100 South; however, access is being maintained throughout the area. Reach Description: Reach 3 is the area along Decker Lake Drive from 3100 South to Research Way (2770 South) and running east to Redwood Road. This area includes many commercial office buildings with thousands of employees. We will continue to work with businesses to ensure access is maintained. Progress continues on the northern portion of Decker Lake Drive just south of Research Way. This temporary closure is anticipated to last until the first part of June. Access will be maintained to all businesses. We thank the many businesses for their support and patience during construction. Please see map for detour information. · Ballast, curb and gutter work continues along the east side of Decker Lake Drive. · Decker Lake Drive is expected to be reopened to traffic the first week of June. · Work continues on the west side of 1070 West. It is anticipated that the west side of 1070 West will be completed in the coming week. · Crews are currently excavating the east side of 1070 West. This work will include new curb, gutter, sidewalk, and driveways. Access to all businesses will be maintained. We thank the businesses for their patience during construction. Reach Description: Reach 7 is the area where the West Valley Line will connect with the current north/south TRAX Line. Construction will take place along Andy Avenue in South Salt Lake. Crews will closely coordinate activities to ensure access is maintained. · Drainage and track work continues between 300 West and 600 West. · Crews are also preparing to tie in to the current north/south TRAX Line. This work is scheduled to be completed during the Memorial Day weekend to avoid disruption to riders. · To minimize impacts to UTA riders, crews will work the following nights to connect the West Valley TRAX Line to the north/south TRAX Line: Sat. May 29; Sun. May 30; Mon. May 31; Tues. June 1. This work will take place along the UTA-owned right-of-way and will not impact the travelling public. What: Utah Transit Authority advises riders and the public of changes to bus, TRAX and FrontRunner service in observance of the Memorial Day holiday. Info: There will be no bus, TRAX or FrontRunner service. Regular service will resume on Tuesday, June 1. For more information, visit www.rideuta.com or call 1-888-RIDE-UTA (743-3882). National Train Day passed uneventfully in Phoenix. Union Station, the mission-style depot turned fortress, protected by its tall prickly steel fence painted cactus green, was immune to invasion by curious passers-by. No-one rode a train through the station, except one hobo who waved from the end platform of a covered hopper -- all freight trains must now traverse the lone remaining passenger track, the bypass line having been removed a few years ago. A man with a camera lurked in the shadow, afraid he might be asked for identity papers by Homeland Security, as a dry scrap of newsprint talking about transit cuts and tax hikes scudded across the broken concrete remnants of the platform. Somewhere, Fred Harvey, whose ghost long ago departed the station's mahogany-and-brass news-stand with its eight-by-four-foot lead-lined humidor still scented with the ever-fainter aroma of Havana tobacco, turned in his grave. Amtrak, the nationalized passenger railroad, deserted the station for America's fifth largest city nearly fifteen years ago, with hope of its return having been repeatedly crushed. Rail Advocates who were selling souvenir t-shirts and whistles. begin. After loading and unloading, #821 quickly departed for Ft.
finances to do it are getting scarce, the foundation has been laid. The Dallas station, despite its perfectly suited location, is crippled by having only three platform tracks, because city leaders who renovated the facility in the early 1980s believed Amtrak when it said that would be enough for any conceivable future needs. The station once had at least ten through tracks, an upper concourse perpendicular to the tracks with stairs to each level for quick and safe passenger flow, and a freight-and-baggage subway. DART's trolleys now serve the station, which is good, but in a way that precludes restoring platforms that would be needed for Dallas to act as a proper hub for regional trains. A little engineering and a lot of hard work could rectify the situation but it's yet another roadblock that could have been prevented. Vigilance today resolves tomorrow's problems. that the company soon to "take over operation of Virginia Railway Express trains from Amtrak wrapped up its first month of nationwide recruitment efforts as it prepares for the June transition." VRE's press release says operation will begin July 1 of this year. Keolis Rail Services America is a division of Keolis, "a significant operator of tramways as well as operating bus networks, funiculars, trolley buses and airport services" according to Wikipedia ; Keolis is owned by a group that includes SNCF, the French railway. The Coast Starlight Communities Network ("a coalition of various interests with the goal of protecting and improving rail service between Washington, Oregon, and California") has prepared a whitepaper describing the route, how trip times have increased by several hours since Amtrak's founding, and what can be done to improve the train's ambience and appeal, and expand the purpose of the train. A positive attitude like this is key to getting results. You MUST include your name, preferred e-mail address, and city and state where you live. If you have filters or firewalls placed on your Internet connection, set your e-mail to receive incoming mail from twa@unitedrail.org ; we are unable to go through any approvals processes for individuals. This mailing list is kept strictly confidential and is not shared or used for any purposes other than distribution of This Week at Amtrak or related URPA materials. The Denver Infill Blog, a excellent blog that is covering what is happening in the downtown Denver area, has just done a three part series on the Denver Union Station project. The project includes three parts including Commuter Rail, Bus Service and Light Rail. The project is centralized around the historic Denver Union station. First some observations about the plan. In the last couple of years I have made a few trips to Denver for meetings. Usually I will ride Amtrak into Union Station and ride the light rail line out to my motel. There is actually several nice hotels/motels located along the Southeast Light Rail line. Right now I can get off the train walk over to the light rail platform and catch my train. Now I will have to walk two blocks from the Zephyr over to the light rail platform. Right now the area is not appealing but the may change once the project comes to fruition. However, I will also be carrying luggage which will make the journey harder. Another problem I see with the plan is that people arriving the the commuter trains will also have to make this walk if they wish to catch a light rail train. While it is only two blocks, how many people would want to get off of Front Runner then walk two blocks to board a TRAX train? Chances are fewer than do it now. To make transit more attractive you need to make it try to make it convenient. Making people walk two blocks to change from Commuter Rail to light rail does not make it more convenient. The Denver Union Station plan also has the same problem as our Intermodal Terminal and that is a lack of expansion room for an expanded rail passenger system. Most of the tracks at Denver Union Station are already set aside for Denver's commuter trains, plus one for Amtrak and another track that can be used by the ski train if it gets restarted (until this year Denver had a train that would travel up to the ski resorts at Winter Park) and in fact the lack of room was blamed in part for the ski train's demise. If or when the day comes that we start expanding our long distance rail passenger network to make it a true network, Denver Union Station will have a tough time accommodating the growth. In addition there is little expansion room if Denver decides to expand its commuter rail network in the future. We face the same problem here in Salt Lake. There is little expansion room at the current Central Station which could create conflicts if we see an expansion of our intercity train network. Even Front Runner is hemmed in by Amtrak and would be hard pressed to expand without a major expensive expansion project. While the Denver plan is visionary and will make some wonderful changes to the area, it is important that when we make this kind of changes, the passenger is considered first and the future expansion is taken into consideration whether that be in Denver, Salt Lake City or any other project of this nature. Below is the FrontRunner South construction update May 22 – 28. Please visit UTA’s FrontRunner South Webpage to learn more about the project. At the 3300 South bridge crews will be excavating the south abutment, working on the center pier and placing and backfilling panels. Construction will begin at the bridge over 4500 South this week. Crews will be installing temporary shoring for the north abutment. The eastbound left lane will be closed on 3300 South between I-15 and 500 West Monday through Thursday and the westbound left lane will be closed Monday through Friday. Water line work and a gas casing extension will take place near 4800 South this week. At the 5300 South bridge crews will form and tie rebar for one of the abutment’s back walls and pour concrete for one of the piers. At the I-215 westbound bridge crews will place structural fill and surcharge and also restore pipe and backfill at the structure. Crews will prepare for slope paving at the 7200 South bridge. Between Center Street and Wasatch Street, crews will be balancing the grade and they will also be placing surcharge at the bridges over Center and Wasatch Streets. The lane closure on 4800 South continues this week for utility work. The eastbound right lane on 5300 South will be closed Monday through Wednesday and the westbound right lane will be closed Wednesday and Thursday under the Union Pacific bridge between 9:00 a.m. and 3:30 p.m. There will be truck traffic with flaggers at 5900 South Tuesday through Friday. The left lane on I-215 westbound will be closed on Tuesday from 9:00 a.m. until 3:30 p.m.
Crews will form, tie rebar and pour concrete for the platform stem walls. Between Wasatch Street and 9000 South crews will continue storm drain work and also install a catch basin. Between 9000 South and 9400 South crews will install stabilization for the retaining wall, and at the flyover bridge crews will work on wall construction and fencing. Storm drain work will begin between 10000 South and 10600 South. Between 11400 South and 12300 South crews will continue mass excavation and embankment work and locate fiber. At the Bangerter Highway bridge, crews will remove sheet pile from one of the piers and also form a pier soffit and form and tie rebar for the pier cap. They will also install shoring, drill soil nails and excavate at the north abutment. · 11400 South, no flaggers, all week. · Tuesday through Thursday, the westbound left lane and the eastbound left lane. Crews will be placing surcharge at the 146th South bridge. Repair work will take place at the wall north of Cranberry Farms along Garden Drive. At the 2300 West bridge crews will form and tie rebar for the north abutment beam seats and begin to install sheet pile shoring for the south abutment. At the 2100 North bridge crews will form the cap for and backfill at pier #5 and begin deck work now that girders have been set. Retaining wall construction will finish this week north of 2300 West and will continue between 2300 West and 2100 North. Between 1500 North and 1220 North crews will install duct bank and between 900 North and 500 West crews will restore fencing. They will also be installing chain link fence at Dry Creek between 500 West and Main Street. Between 300 South and Center Street crews will install reinforced concrete pipe and a catch basin. There will be truck traffic at the south end of Garden Drive near Cranberry Farms Monday through Thursday. At the pedestrian tunnel crews will be forming and tying rebar for the footings and also install helical piers. They will also be excavating and stabilizing to prepare for construction of the ramp and stairs at the station site. Near the site of the American Fork Station, crews will be placing sub ballast. They will also be installing signal houses at Storrs Avenue and 100 East. Crews will remove surcharge at the American Fork River bridge and also place bottom ballast. Between 100 East and 1100 South in American Fork crews will place ties, and between 400 North in Vineyard and Geneva Road in Orem crews will place bottom ballast and ties and skeletonize the track. Between Geneva Road and 400 South crews will also be placing ties and skeletonizing the track, and from 400 South to 800 South crews will place sub ballast. · Geneva Road, Orem, with flaggers, Monday through Wednesday. At the Park and Ride Lot crews will work on power, pave the east approach, form and pour curb and gutter and continue landscaping work. Crews will continue to place gravel at the Orem Station site and also place vapor barrier and rebar. Mass excavation work will take place between University Parkway in Orem and 2000 North in Provo and at 2000 North crews will install chain link fencing. Crossing upgrade work will continue this week at the 2800 West crossing. Between 820 North and Center Street crews will de-stress and surface, line and dress the track. Crews will continue paving, striping and median work for the road realignment at 900 West and 500 South. Crews will place ties and skeletonize the track between 700 West and Freedom Boulevard, stabilize the grade between Freedom Boulevard and University Avenue, and install permanent fencing, clear and grub the corridor and conduct mass excavation between University Avenue and 900 South. Crews will work on light poles and place granular fill for the platform. Construction progress continues on the UTA West Valley TRAX Line. To keep business and traffic impacts to a minimum, this five-mile project has been separated into seven construction “reaches,” or segments, for management and planning purposes. The map below shows each construction reach in a different color, starting with Reach 1 in light green on the south end of the project and ending with Reach 7 in light green on the east end of the project. · Crews continue concrete work on ramps, steps and sidewalks near West Valley City Hall. · Overhead wire work continues near West Valley City Hall. · Crews are forming and pouring the platform at West Valley City Hall. · Crews are constructing the driveway entrance to businesses just north of 3500 South on Constitution Boulevard. Access will be maintained as this driveway is constructed half at a time and is scheduled to be completed in approximately one week. · Crews will begin forming and pouring the station platform near West Valley City Hall the third week of May. · Crews are working on curbs and sidewalks near 3100 South and Decker Lake Drive. Reach Description: Reach 3 is the area along Decker Lake Drive from 3100 South to Research Way (2770 South) and running east to Redwood Road. This area includes many commercial office buildings with thousands of employees. We will work with businesses to ensure access is maintained. · Progress continues the northern portion of Decker Lake Drive just south of Research Way. This temporary closure is anticipated to last until the first part of June. Access will be maintained to all businesses. We thank businesses for their support and patience during construction. Please see the map for detour information. Track and station work continues in the center of Decker Lake Drive. · We encourage motorists to obey the posted speed limits. · Decker Lake Drive is expected to be reopened to north/south traffic the first week of June. Reach Description: Reach 4 runs through the Chesterfield residential area along 2770 South and along the Decker Lake Canal and the Crosstowne Trail. We will work with residents to ensure a safe working environment that provides access to their properties throughout construction. · Work continues on the west side of 1070 West. Crews will form and pour curb, gutter, sidewalk and driveways. It is anticipated that the west side of 1070 West will be completed in the upcoming week. * Redwood Road between 7800 South and 9000 South will be subject to ongoing lane closures through late May. The full closure of Redwood Road has been postponed to later in June due to inclement weather this weekend. *Winchester Street will be closed between the TRAX crossing and 300 West (Cottonwood Street) from May 24 through June 1. Work continues on the landscaping at the 5600 West station and Park & Ride. Finish work at the Daybreak South and Daybreak North station platforms is ongoing. Track and grading/drainage work is moving forward in Old Bingham. OCS installation is essentially complete, and the station platform concrete work continues. TRAFFIC IMPACT: The lane closure originally scheduled for this weekend (May 21-24) has been postponed. The Jordan River Parkway Trail will be closed between Thursday, June 3 and Friday, June 18 as crews begin widening the embankment of the rail right-of-way between 7800 South and the Jordan River. Embankment work is in progress between 1300 South and 7800 South. The concrete has been poured at the 7800 South bridge, and removal of the forms will be complete this week. NEW ACTIVITY: Embankment work between the Jordan River and 7800 South. ACTIVITY: 7800 South bridge deck work. TRAFFIC IMPACT: Lane shifts on 7800 South from Monday, May 17 through Tuesday, May 25.